Help hold policymakers accountable for safe and accessible streets. 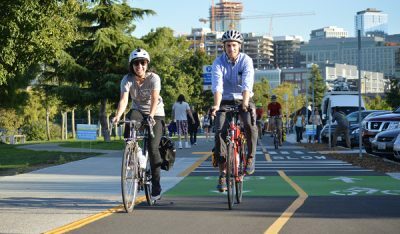 We’re dedicated to using our powerful statewide bike policy and advocacy work to retrofit Washington’s infrastructure to improve health, safety, and build up our communities. Donors like you make it possible for Washington Bikes to host bicycle events like the Ride in the Rain Challenge and the Bike Everywhere Challenge. Together we can grow bicycling throughout Washington! $250 kicks into high gear! We pay a small fee to accept online payments via credit card or PayPal. Would you like to pay a few bucks to cover it? Yes I’ll chip in $2 to help cover the cost of this transaction. Thank you for giving to Washington Bikes! Please note: since January 1, 2016 all tax-deductible charitable programs will be conducted by Cascade Bicycle Club. If you’d like to make a tax-deductible gift to support programs such as advocacy and education, please give through the Cascade Bicycle Club at www.cascade.org/donate.